Creatine monohydrate is an important component within the human body and is found in highest concentration within the muscles. It is naturally produced within the body and can be taken in through some foods. Both seafood and meats are very rich in quality creatine. It can also be manufactured and provided in supplement form. 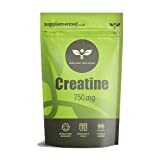 Creatine 750mg has many functions that make it a great supplement to take alongside an exercise programme. Firstly it provides energy to the body during a workout which means you can work at a higher intensity for a longer period of time and it helps decrease the amount of time the body needs to recover. Our muscles are made up of 80% water, and Creatine helps to draw more water into the muscles. This results in muscles looking bigger and more pumped. However it is important to ensure you stay hydrated before, during and after workouts as this water is drawn from other parts of the body.